Please note, this is not a how to raise a Shiba Inu. This is a documentary on our experiences with our dogs, and ours alone. All dogs have different personalities so each experience will be different. Know your limits when it comes to patience and understanding. Let me start off by saying I love my dogs. 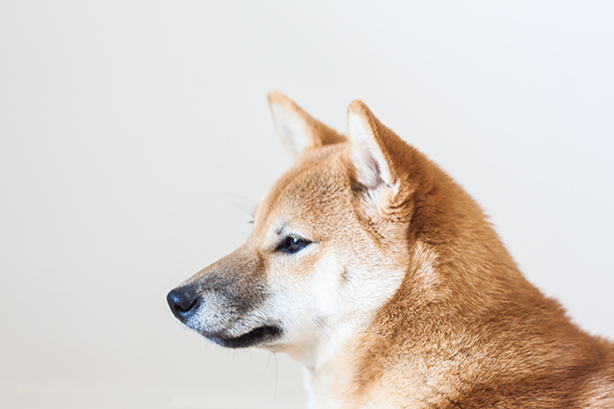 The Shiba Inu is a fantastic breed, quirky, loving and adorable. But they are not for everyone. They can be difficult, stubborn, and confusing. They are not meant for people looking for a first time dog. They have traits that Sander and I have grown to love and accept but this doesn’t mean that everyone will. Even our friends and family have a hard time understanding our dogs. Sander and I have raised them so we know what to expect and how to deal with their behavior. Their behavioral issues might be because of their breed. Their behavioral issues might not be because of their breed. Whatever the reason, I don’t believe that the Shiba Inu is for a first time dog owner. If you’re willing to put in the time and effort though, they are wonderful dogs. That’s it. If you want detailed literature on everything we’ve dealt with it, then feel free to continue to read. 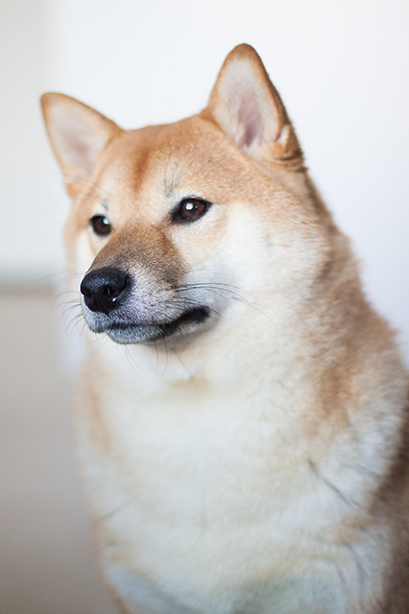 But if you want the short answer on if you should get a Shiba, ask yourself these questions. Can I love a dog with mood swings? Can I love a dog that will be my personal court jester? Can I love a dog that shows affection via nibbles and biting? Can I love an intelligent dog that learns fast and remembers well? Can I love a dog that may not listen and requires extra love and training? Can I love a dog that is very independent? Can I love a dog that is loyal to few and wary of everyone else? If you said no to any of these, you may want to reconsider. To find out why, please continue reading. Sander and I knew that we have little space for a large dog. Even a medium dog would be difficult to keep in the current flat we have now. To give some clarity, our space is around 67 m2. We have a kitchen/living room/office space in for our main and largest room. This means we have no dining area and we eat on the couch. Sander and I enjoy long walks and casual biking. The Netherlands has fantastic weather (most of the time). There are so many nearby parks, it’s impossible to say no to going for a walk. We do spend more of our time at home though. Sander’s parents have two medium sized dogs. 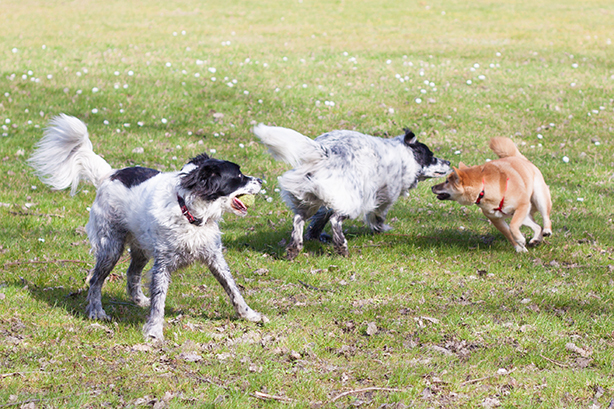 Our dog had to be able to keep up with their playfulness and energy. I wanted to adopt a dog from the local shelter but the ones up for offer were pit mixes. I have nothing against pits or any larger dogs but we needed something small. We wanted to be sure we knew what breed we were getting and not guess at what to expect. TL;DR: We wanted a small dog, energetic when we wanted to be and calm when we needed her to be. We also wanted an intelligent breed that could handle large breed dogs. We did a lot of research on breeders in the area. Unfortunately it came down to only a select few, and out of them, only one had a single female left. For me, buying a puppy is an important process, and emotions should not get in the way. For Sander, once he saw her, it was love at first sight. 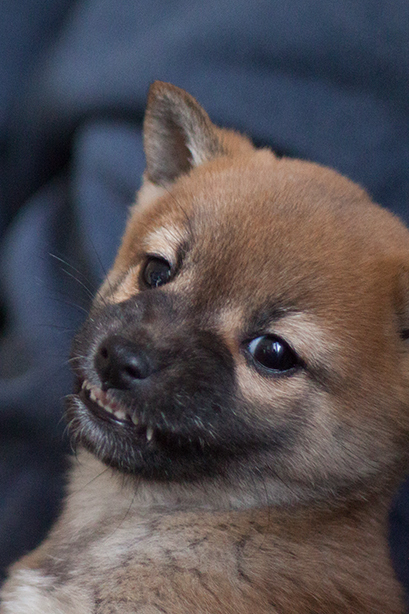 It was clear that this tiny Shiba pup was not interested in us at all. She was too busy sniffing around the other dogs (these breeders had some Akita puppies as well). She was unafraid to be with strangers. She didn’t like hugs. She didn’t like being on her back. In short, she was a feisty one. We couldn’t walk away from her though. Sander was sold on the spot. She was fantastic on the ride home. The trip was about two hours in the car and she slept most of the way. We stopped once for her to use the bathroom. After a few days we noticed she was having very bad diarrhea. Unsure if it was stress or something else, we took her to the vet and found she had contracted giardia. It was a very scary time for us. We cleaned like never before to try and get rid of the parasite. It took months before poor Booker was clean and clear. To this day, Booker has a terrible stomach. She can have diarrhea if she gets too excited. Also the scent of her poop can gag a maggot. During this early time with her I began to regret her. We had 3am morning calls from her to clean up the most disgusting pudding poops. I was also scared about contracting the parasite myself. One night I broke down and told Sander I couldn’t deal with it all. He, like the level headed man he is, calmed me down and ensured me it was a phase and everything would work out. He encouraged me and promised Booker would be well soon. We’d forget about all the horrible events that came from her being sick. I’m so glad he did. TL;DR: Booker got sick and I wanted to give her back but Sander said we’d pull through it. Booker was high energy and playful when awake and wasted when tired. We joke to this day that, Booker has only two modes, feisty mode and wasted mode. We would go on long walks with her and she would never tire. As soon as we were home she’d lie down and we wouldn’t hear from her for hours. She would die to spend time with Sander’s parent’s dogs, Snowy and Lucky, who are friese stabij/collie mixes. Booker would only step away from them to take water breaks. We took the trio out to parks for a few hours at a time. The three of them ran all their energy out by chasing balls and each other. The larger wooded areas are far from traffic and safe for dogs to be off leash. We would only take Booker off leash in these situations because we knew she will follow another dog back to us. For example if we call Lucky to come, Booker will follow too. I’ve read many posts recommended that Shibas should never be off leash. Sander’s determined to train her. For the most part she does well. She comes when she’s called unless there’s another dog around. She’ll follow other dogs and play with them instead of returning to us. We’re working on it but she’s stubborn! Booker’s bitten through a few things but she’s usually pretty good at keeping her teeth to herself. She was always given treats to chew on as her baby teeth were falling out so we only lost a total of 4 wired products. TL;DR: A roller coaster of energy waves with Booker but if she’s gotten enough exercise, she’s out for hours. Booker caught giardia quite young so she would often run around the house spewing the smelliest brown soup. It was awful. I would wake 3am to her whining to be out, only to have her dash away from me to a corner she favored to let all her poops out. After a week and a half of enduring and having that break down, Sander woke up to deal with her. I always felt bad since he had work the next morning but he was an angel and never complained. Other than the poop issue, Booker was amazing at being house broken. She learned that grass was where the waste should be. She used to have one or two accidents once a month but after she turned 5 months, she was completely over it. While she hates putting on a harness to go walk, she enjoys going outside. She gets to run and be a wild animal… It’s catching her to get her harness on that’s the issue. TL;DR: Booker had a few issues in the beginning but was easily housebroken. At nine months, we finally let her sleep outside of her crate. She did well. She slept in the bedroom with us, left a few times to get some water, but returned right away. Now she enjoys sleeping on the sofa. She’ll begin the night with us and later move out to her favorite place. She’s quiet (unless there are neighbors talking outside our door) and usually out the entire night. She’s even gotten used to the idea of sleeping in bed with us. We know Booker values her personal space. It’s a thrill to have her jump into bed with us! TL;DR: As she gets older, Booker ages gracefully but she’s still a work in progress. Googling “Shiba Inu” yields these results for temperament: Fearless, Keen, Charming, Faithful, Alert, Confident. I completely agree with all these traits. She’s also hilarious to watch, super silly and plain ridiculous at times. She’ll make a tunnel under her doggy bed and lay there forever. She’ll chase her back left leg instead of her tail (although she chases that too). She grumbles a lot, as if she’s talking to herself. She’ll also people watch from either a window or the outdoor furniture. Booker also can’t stand children. They’re loud and make sudden movements which she is not a fan of. We don’t mind because we don’t intend on having kids. I’ve seen a lot of parents raise Shibas with no issues, but Booker isn’t one of those Shibas. She’s made many friends in the neighborhood and all are large dogs, except one. Booker’s best friend is Kaya, a Belgian Malinois, who is nothing but high energy and rebellion. Another friend of Booker’s is a Pom/Terrier mix named Seb. He’s got that feisty little dog blood in his bones and can’t help but chase after Books when he sees her. The unfortunate part is that Booker now gets a bit more defensive around other dogs. She’s very playful but sometimes that translates as aggressive to other dogs. We do our best to relax her when other dogs come otherwise we avoid strangers. Booker hates the water. Hates it. 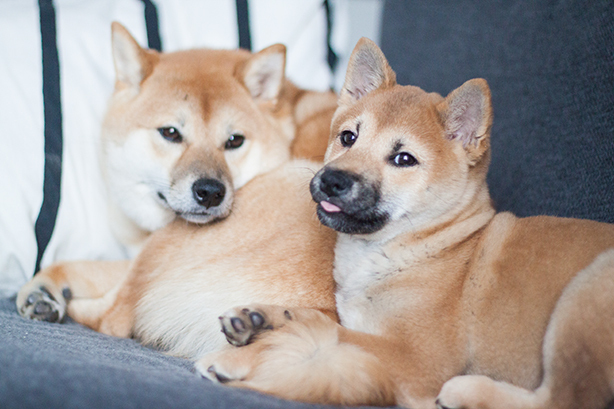 Shiba Inus are known for being very clean dogs. Booker never has an eye booger, always has white paws, and never leaves her lady bits unwashed. But, these cleaning routines are on her terms. Once water and shampoo come in, all bets are off. What did surprise us though is when we went to the beach and she became a mer-pup. Booker had no trouble running in and out of the ocean to play with the other dogs in our group. Yet, she’s still a dog and will not resist rolling in duck poop mixed with mud. The most disgusting thing she’s rolled in has been fresh horse poop. It is important to take note that Shibas shed. A lot. You could make several other Shibas out of the fur of one. We live in a flat and share an elevator with our side of the building. I need to vacuum at least once a day to keep the carpeted area outside of our apartment clean. TL;DR: Although they are very clean dogs, be prepared for a screaming mess every bathtime. 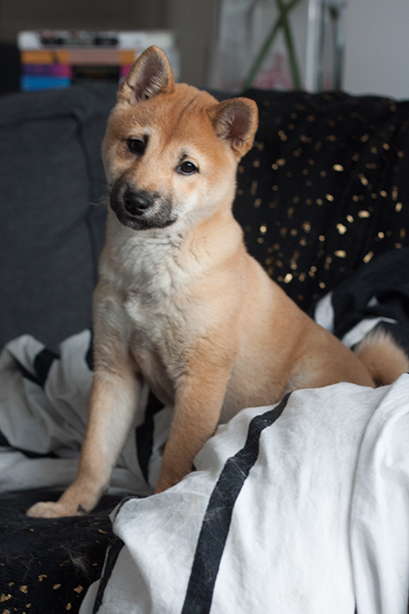 And now on to our second Shiba, Haru. Where to begin? Haru was a puppy was a dream come true. She was so adorable and didn’t have the stomach issues Booker had. Haru came from a breeder who loved the breed and did it as a hobby. Haru came from a litter where she was the only female. She was a feisty one from the beginning. We went to visit her a week before we brought her home… She was so small and so cute. We took our time watching her to see her personality. The breeder encouraged us to take a male to balance our household but in the end we insisted on taking Haru. The next week she came to pick her up (we had to reschedule several times with the breeder because of her schedule). We were so relieved when she was finally home. She wanted to play with Booker that we couldn’t keep them apart for too long. Right away they were the best of friends. 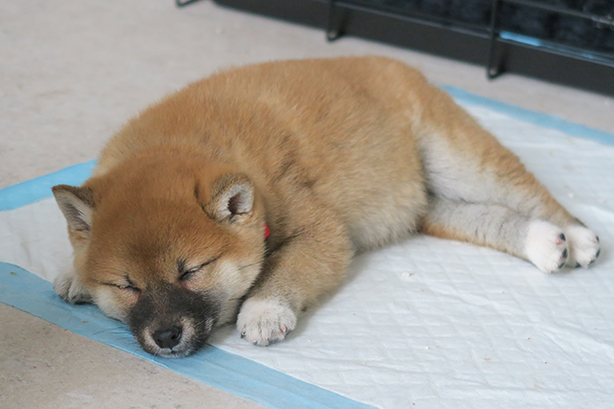 Haru had troubles sleeping through the night so I did what people should not do. She began the night in her crate and when she would wake at 2am I would sleep with her on the couch with her on my chest. It was the only way she would stop crying and so far it doesn’t seem to have created any behavioral issues. When she got over the initial loneliness she started to sleep just fine through the nights. When she hit 8 months we went on vacation and allowed her to sleep in the bed with us. She hasn’t slept in the crate since! TL;DR: Haru is an angelic puppy! Like Booker, Haru learned that outside was where she needed to go. Unlike Booker, Haru took much longer to be house broken. She would find anything to piddle on if she needed to go. She seems to believe that if there’s fabric on the floor, it’s a good place to pee. We take her out often but there’s some need she has to fill by peeing on fabric. This includes towels and clothing. She’s gotten over it now and doesn’t done that in a long time. As of updating this post, Haru is 1 year and a few months old. She’s able to keep up with Booker on a daily basis. We even sometimes find her bullying Booker! It’s nothing neither of them can handle. She often goes into the bedroom for naps and comes eagerly when called. She’s just as stubborn as Booker is but she’s even sweeter than her older sister. Haru is the sweetest pup we’ve had to date. She’ll sit in your lap, follow you around and plays well with others. She does have her wild Shiba side but she’s more cuddly and adorable than Booker was at her age. She loves to snuggle and sleeps in a few choice places if it’s during the day. We call her our pillow pet. Haru will always be interested in making friends. She’s friendly, gentle and plays well with others. I love watching her play with Lucky… It’s the sweetest thing to watch. Haru hates water. If you’ve seen a cat hate the water, this is Haru as well. If you don’t know what a Shiba Scream is, you should Google it. It sounds like their fur and legs are being ripped off of their body. It’s warm water and a good scrub but it sounds like they’re dying. Unfortunately for Haru, she’s a pig. The biggest incident we’ve had with her was at a park one day. It was her first day off leash and she found a huge, fresh pile of horse poop to roll in. She needed a bath and that’s when we realized that bathing her was going to be a challenge. It’s true that I’ve heard lots of horror stories about the breed. I’ve seen people complain they are too difficult. 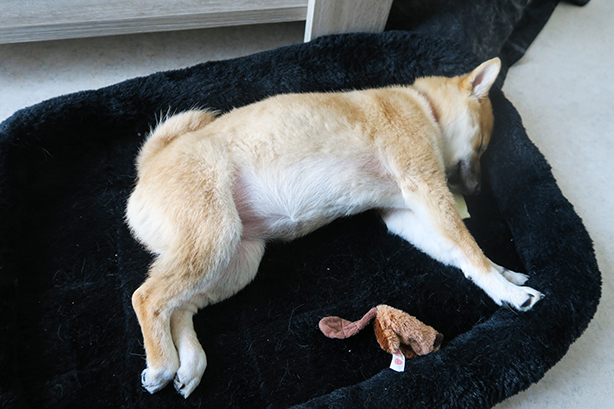 Shibas can be too hyper, too destructive and stubborn. 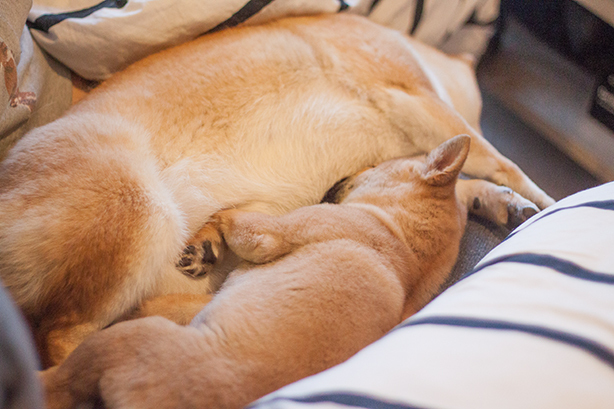 It all comes down to how you care for your Shiba Inu. If you show them that you are the pack leader, and they should listen to you, then you’ll be fine. I can’t say we haven’t had destruction in the house. Both dogs acquired a taste for our walls during the teething stage. Our walls are cement so they didn’t do much damage. Now that they’re over a year old I haven’t seen them eat the walls since then. For a long time Haru had anxiety issues though. She’s left holes in the wall by the front door where she’s scratched to be let out. She used to do this when I went out of the house but she hasn’t done it in a long time. She understands I’ll be right back to bother her! I know it’s not possible for everyone to stay and watch their dog all day. I have the luxury of doing so. Make sure that you love them, give them a good workout daily. Never give in to their bad behaviors. Our Shiba Inus are wonderful, affectionate, attentive dogs. They seek us out and nibble on us lovingly. They always make us laugh with their quirks and undeniable lust for play. They are fantastic dogs and I would not trade them for anything. TL;DR: Treat them like like family, and you’ll have a loving and super adorable dog at your side!